That’s exactly how I feel when I travel for work. Caritas is vast – it’s in 165 countries – and it works on many issues, on a variety of levels and in many different contexts. We’re in Sindhupalchok, the area worst affected by last-year’s earthquake and after-shock two weeks later. Of the 9000 people who died, well over 5,000 were in this district. I went to visit one of the people who’d received Caritas help last year. Shanti Phori, 25, lives in a small village called Kitar. She was pregnant and out gathering fodder for animals when the earthquake hit. Her 3-year-old son was home alone and two other children at school. She ran home and found her house had collapsed and her son injured. 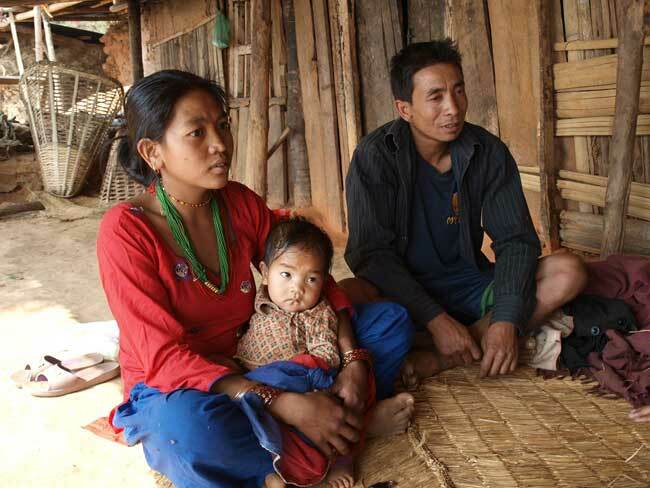 Caritas provided Shanti and her family with food and clothes in the immediate aftermath of the earthquake. Soon after she got corrugated iron sheeting so the family could build a temporary home. She is also part of a cash-for-work programme where Caritas pays her to help clear debris. But the reality of families who survived the earthquake is extremely complex and fragile. To visit the communities we met yesterday we spent over an hour travelling up a mountain in a 4×4 on a very rough dirt track. We were bouncing around like bingo balls inside the car and we often had to stop because of the dust clouds created by the car in front. The communities were very isolated and getting any help to them – or if they need to get help in an emergency takes a lot of time and patience. As she breast-fed her 9-month-old son, Shanti told me she was really worried about how she was going to get water in the future. The springs near her house have been drying up and the last one looks as though it too will dry up. The issue of water is of real concern for many of the communities Caritas has been speaking to. In the first community we went to in Thokarpa neither the school nor the health centre had water. Family members would walk an hour to fetch water from the river. My travelling companion, Sunil Simon from Caritas Austria, told me that in a few months the rainy season would arrive and the already dangerous mountain roads would have rivers of water pouring down them. But this doesn’t solve the long-term water issue. Caritas has been assessing needs in the villages and planning how to step up its work in ‘WASH’ (Water, Sanitation and Hygiene). I went to Thokarpa and Kitar with Cardinal Tagle; Archbishop Salvatore Pennacchio, Apostolic Nuncio to India and Nepal; Bishop Peter Stasiuk of Caritas Australia; Fr Silas Bogati, director of Caritas Nepal; Sunil and colleagues from Caritas Germany, Italiana, Australia and Trócaire. Part of our reason for being in Nepal with a number of other Caritas colleagues is to show solidarity with the Nepali earthquake survivors and to also look at what we could learn from the past year and how we could best accompany communities in the future. We were greeted by hundreds of people in Thokarpa and a band accompanied us up the dirt track. As we reached the entrance to the village people started to put flower garlands around our necks until our faces were half-covered by the pink flowers. It was an incredibly warm and joyous welcome by people who had suffered a lot and who were still going through a very difficult time. We sat down in front of the hundreds of people under an awning to keep the beating sun off us and they gave speeches about how Caritas had quickly given them help, they also performed dances and songs about Caritas. It was a beautiful ceremony but as I looked at the faces of the people watching, many had the worn yet stoic look of people who had been through a lot. Other NGOs who gave initial aid have now left Thokarpa. Caritas will stay because it is part of the community affected. Caritas is investing over €36 million to help communities recover from the earthquake over the next few years. The money will be invested in helping rebuild communities as well as houses and in healing the wounds inflicted by the disaster.